Just imagine having a place where plants thrive all year. A greenhouse gives you a controlled, pleasant environment that can give you the sunlight, warmth and humidity plants need. Being able to grow exotic fruit, orchids, vegetables, herbs and flowers all year makes it a place of wonder. Having a one is very rewarding, but building your own is even better. Decide on what you want to grow. If you want to grow vegetables for instance, you will need maximum light and headroom. Whatever your primary plants need, that is the environment you want to create. 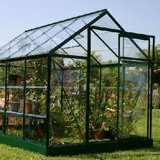 Careful planning is important before a home greenhouse project is started. Building a one does not need to be expensive or time-consuming. The final choice of the type will depend on the growing space desired, home architecture, available sites, and costs. It must, however, provide the proper environment for growing plants. One common mistake when building a greenhouse involves preparing the site prior to having the exact specifications of the structure. As a general rule, you should never prepare a foundation prior to purchasing your greenhouse. Many people find that they are not able to find a one that fits their foundation size, or that it differs slightly from what they had planned for when constructed. Permanent foundations should be provided for glass, fiberglass, or the double-layer rigid-plastic sheet materials. The manufacturer should provide plans for the foundation construction. Permanent flooring is not recommended because it may stay wet and slippery from soil mix media. A concrete, gravel, or stone walkway 24 to 36 inches wide can be built for easy access to the plants. The rest of the floor should be covered by several inches of gravel for drainage of excess water. Water also can be sprayed on the gravel to produce humidity inside. We recommend that you do not lay a formal foundation for your structure. It is much better to simply level the ground and then place pea gravel or flooring material where you want to put the greenhouse. This allows for much better drainage, which helps to keep the it clean and disease-free. It also makes it possible to easily move it if necessary and is much less expensive. Your building should be located where it gets maximum sunlight. The first choice of location is the south or southeast side of a building or shade trees. Sunlight all day is best, but morning sunlight on the east side is sufficient for plants. Morning sunlight is most desirable because it allows the plant's food production process to begin early; thus growth is maximized. An east side location captures the most November to February sunlight. The next best sites are southwest and west of major structures, where plants receive sunlight later in the day. North of major structures is the least desirable location and is good only for plants that require little light. Deciduous trees, such as maple and oak, can effectively shade the greenhouse from the intense late afternoon summer sun; however, they should not shade it in the morning. Deciduous trees also allow maximum exposure to the winter sun because they shed their leaves in the fall. Evergreen trees that have foliage year round should not be located where they will shade the greenhouse because they will block the less intense winter sun. Good drainage is another requirement for the site. When necessary, put the building above the surrounding ground so rainwater and irrigation water will drain away. Other site considerations include the light requirements of the plants to be grown; locations of sources of heat, water, and electricity; and shelter from winter wind. Access to the site should be convenient for both people and utilities. A workplace for potting plants and a storage area for supplies should be nearby. Green house growers are natural experts at reducing consumption, reusing materials, and recycling waste. Potting soil can be baked in the oven to sterilize it and reused again the next year. Clay pots and plastic growing trays can be cleaned with bleach and water, reducing waste. Old newspapers, and kitchen waste are composted for use in other areas of the greenhouse. Going green in the green house is a great way to help the environment and reap the benefits of lush, healthy fruits and vegetables in the process. With a few easy changes, your greenhouse can truly become a Greener House, too.